HMAS Melville and and her sister ship HMAS Leeuwin replaced the now decommissioned vessels HMA Ships Moresby (II) and Flinders in 2000. Both ships take their names from prominent points on the Australian coast. 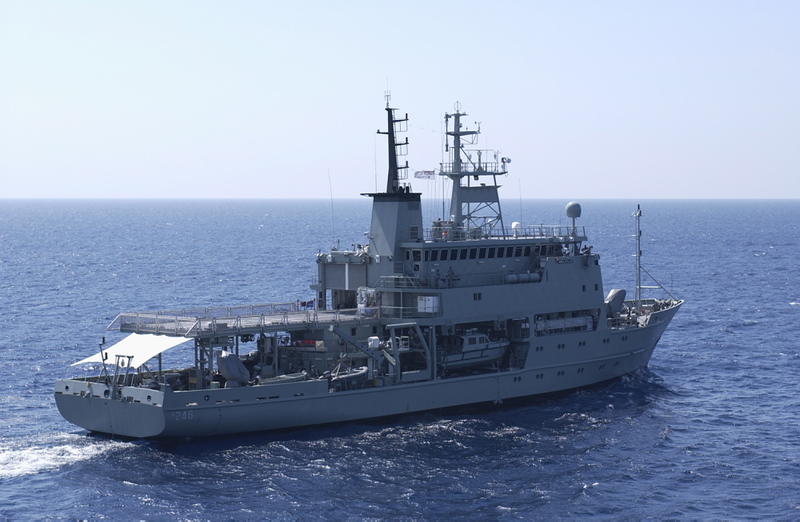 HMAS Melville is named after Melville Island, just to the north of Darwin. Melville was launched midway through 1998. The ships were built by NQEA in Cairns, North Queensland. HMA Ships Leeuwin and Melville enable the Australian Hydrographic Service to gather high quality hydrographic information at a much greater rate than the ships they replace. The ships are 71 metres in length, with a beam of 15 metres, and a draught of 4.3 metres. Each ship displaces 2,550 tonnes and is manned by a crew of 46 officers and sailors. A state of the art Hydrographic Survey System (HSS) developed by STN Atlas will integrate accurate position information with data from a multi-beam echo sounder, towed side-scan sonar, single beam echo sounder and a forward-looking sonar. The ships will also carry three fully equipped 9 metre Survey Motor Boats for surveys in waters not suitable for the ships themselves. Both ships are capable of carrying a helicopter to assist in survey operations.